The loss of a parent is profound. The bond between mother and child is unending, even when one is no longer physically present. A client presented a greeting card; the last one given to her by her recently deceased mother. Her Mom signed all the cards for years in the same way â€œ Much Love! Momâ€�. 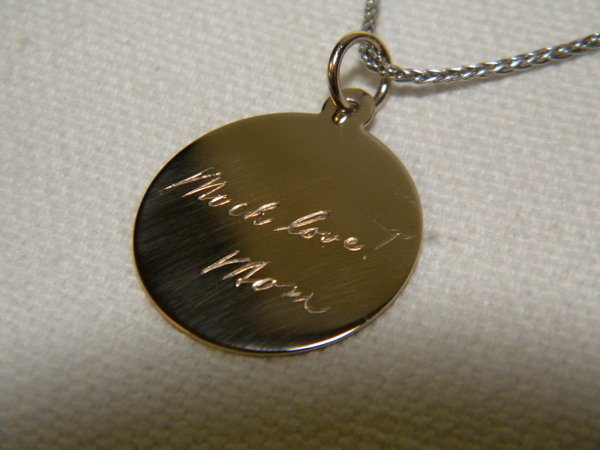 She asked if there was any way to duplicate her Motherâ€™s signature on a pendant that she would wear close to her heart. Absolutely. The art of hand engraving was the perfect solution. Our hand engraver duplicated her motherâ€™s signature on a 14K yellow gold round disc. The simplicity of the disc made the engraving the focal point of the piece. She loves this piece and wears it daily, keeping her Mom close at heart.